William Stokes retired with 46 years of experience working on the Michigan Central and New York Central railways, in addition to active service in the Boer War and the First World War, a term as St. Thomas Mayor, several years as an alderman, membership in many service clubs and fraternities, and an early job dressing up as the Quaker Oats mascot. Born in Fingal, Ontario, Stokes was still a teenager when he went overseas to fight in South Africa. Returning at the age of 21, he started his railway career with the Michigan Central Railway as a freight brakeman in 1903. 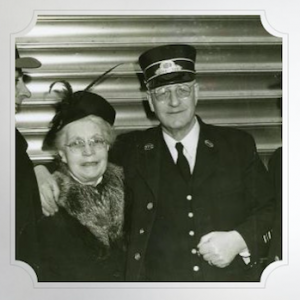 He became a freight conductor in 1919, and was promoted to the rank of passenger conductor in 1928, a post he held until his retirement in 1949. He conducted such trains as the New York Special, New England Wolverine, and the Detroiter right up until his retirement. In addition to his nearly half-century railway career, he served 40 years with the 91st Battalion. His only break from working on the railway came when he fought in France during World War 1. He held the rank of sergeant for the duration of the war. He was wounded at Vimy Ridge, Hill 70, and Passchendaele. He also later served as President of the 91st Battalion Association. In between his South African service and the start of his railway career, he worked as a deckhand on a trans-Erie ferry boat, peddled fresh-baked bread door-to-door, and worked as publicity director for Quaker Oats, a memorable job that had him dressing up as the Quaker Oats mascot. Any spare time he had was filled with obligations to fraternities and service clubs – he was in the Orange Order, the Oddfellows, the Kiwanis Club, and the Freemasons. He held prominent positions in multiple lodges. He was also an alderman for seven years, and the mayor of St. Thomas from 1928-29. He also spent two years on the St. Thomas Board of Education, and was a president of the Southern Ontario Highways Association. He was on the board of Grace United Church, as well. Three of sons followed him into lengthy railway careers.